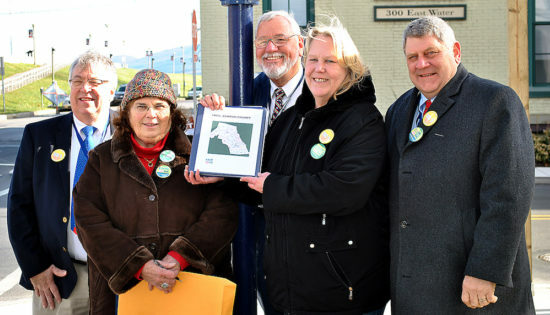 On December 7, 2017, county officials joined citizens and volunteers from Fair Districts PA on the Clinton County Courthouse steps for a press conference to celebrate this unprecedented achievement: 100 percent of Clinton County’s municipal and county leaders taking a unified stand against gerrymandering. The activity began with music from millennial social activist Christopher LaRose, including his award-winning song “Susquehanna Waters.” Then Rose Reeder, coordinator for Fair Districts PA of Clinton County, noted that it was Pearl Harbor Day and asked if any veterans were in the crowd. She thanked them and their families, and two Fair Districts PA volunteers, Sandi DeBonis and Pat Hancock, led the group in reciting the Pledge of Allegiance. Local leaders were happy to join their constituents and stand behind this issue: Commissioner Jeff Snyder called it a “no brainer,” while Commissioner Robert “Pete” Smeltz noted that, once he and his colleagues had done their homework, they recognized that this was an issue about principle, not party. He also noted that anyone who can get everyone in the county to agree has really done something special. Commissioner Paul Conklin agreed, stating that it was all about education, and noting that Reeder’s ability to clearly present the facts and explain how gerrymandering is bad government is what led to gaining 100 percent support in Clinton County. Meanwhile, Reeder insisted this is just an example of good government as it should be. Fair Districts PA’s statewide resolutions coordinator, Jamie Mogil, took the podium to define gerrymandering using specific issues from Clinton County’s congressional map, pointing out that Erie had been split to become part of Clinton County’s district, the 5th Congressional district—even though it’s 200 miles away and has very little in common with our rural area. Mogil also talked about the long-reaching effects of gerrymandering, such as gridlock, voter apathy, and lack of responsiveness to the voters of the district. PA Senator Joe Scarnati, who represents the 25th district, which includes Clinton County, responded through his staff that he was unable to participate or send a representative because he was named in the Agre v. Wolf case. Mogil explained that this court case, which focuses on past maps, is irrelevant to the resolutions passed in Clinton County, which ask for an independent citizens commission to be enacted to draw future maps. But Scarnati has not yet co-sponsored legislation intended to do just that: SB 22. In fact, he is even a member of the Senate State Government Committee, where SB 22 is waiting to be heard. Throughout our presentation, Fair Districts PA emphasized that SB 22 and its counterpart in the PA House, HB 722, must move from their respective State Government committees to the floor for a vote before the close of this legislative session in July. To that end, the Clinton County group plans to personally deliver their binders of resolutions to both Scarnati and U.S. Representative Glenn Thompson at a later date. Joan Heller read the names of the 29 municipalities, and the County Commissioners, asking the crowd to join her in a moment of praise for each. Finally, a legislative assistant read a prepared statement from Representative Mike Hanna, praising the efforts of Rose Reeder and all the volunteers from Clinton County. Hanna, who represents the 76th district in the PA House, has long been a supporter of an independent redistricting commission, and is a current co-sponsor for HB 722. Throughout the event, speakers emphasized the amazing group of leaders in Clinton County who practice government as it should be. In closing, Reeder paraphrased Ronald Reagan: gerrymandering is a national scandal preventing the voice of the people from being heard. She reminded attendees that the issue isn’t about party, but about the principle of “one person, one vote,” and ended her comments with the rallying cry of “onward to more progress” as the crowd cheered enthusiastically. Father-daughter filmmaking pair Robert and Rachel Millman also attended the event and held in-depth interviews with Reeder, Mogil, LaRose, and Congdon for potential inclusion in Line in the Street, their five-part series about gerrymandering. All together, this event created great hope for supporters of fair districts—in Clinton County, and across Pennsylvania.